Geraniums are big, showy annuals that when planted in a flower bed, hanging basket or patio container will contribute bright color to the landscape from early summer to fall. Although geraniums are beautiful, buying geranium plants can be expensive and can add extra expense to your gardening budget. If you're adventurous, you can harvest the seeds that appear in autumn and save the seeds for planting the following year. 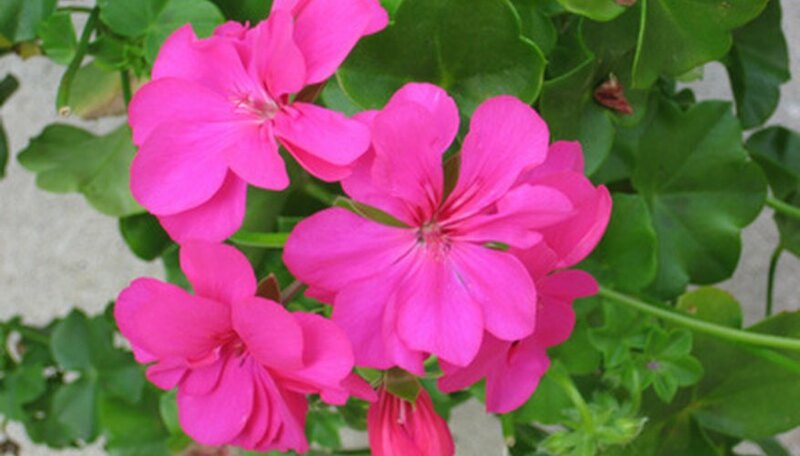 Select a healthy geranium plant with a brightly-colored bloom. Watch for seed pods to develop at the base of the bloom after the geranium is finished blooming in early autumn. Wait for the seed pod to turn dry and brown before harvesting the seeds. Cut the seed pod and let it drop into a brown paper bag. Place the bag in a warm, well-ventilated spot for at least two weeks. Shake the bag occasionally so the seed pods can dry evenly. Pour the contents of the paper bag onto a tray or baking sheet. Use your fingers or tweezers to pick the small black geranium seeds out of the plant debris. Small bits of debris mixed with the seeds are harmless. Place the geranium seeds on a paper towel until the seeds are completely dry, as damp seeds can mold during storage. When the seeds are dry, they will be hard and brittle and will crack when you try to split them with your fingernail. Place the dry geranium seeds in a labeled paper envelope, and put the envelope in a glass jar. Wrap two tablespoons of powdered milk in several layers of tissue, and put the packet of powdered milk in the glass jar. Put a cover on the glass jar and place the jar in the refrigerator or in any cool, dry spot where the temperature will be below 55 degrees Fahrenheit. Plant the seeds the following spring, as geranium seeds are usually viable for only one year. The timing of harvesting geranium seeds can be difficult to pinpoint, as once the seed pods are dry, the seeds will be quickly expelled. To avoid losing the seeds, cover the wilted blooms loosely with cheesecloth or muslin and tie a string to secure the fabric around the bloom.